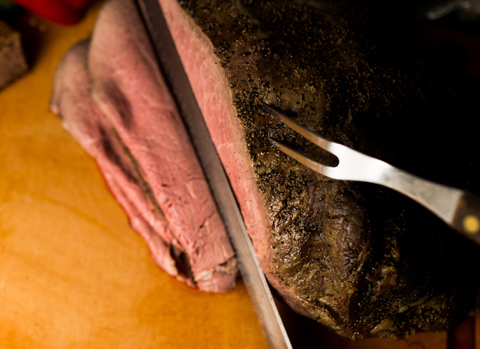 MGM Roast Beef was founded on the belief that good food comes in all forms. The idea was simple – by using the freshest high-quality ingredients, we would make the most flavorful and delicious sandwiches in D.C. Which is exactly what we’ve been doing since opening in 2008. 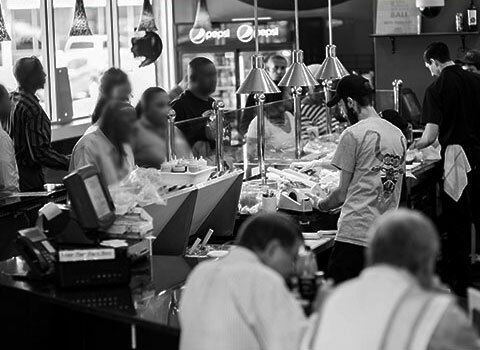 What sets MGM Roast Beef apart from the rest are the juicy slow-roasted hand carved meats, freshly baked breads, delicious sauces and toppings, as well as our true love for food and dedication to customer satisfaction. Let the food speak for itself – THE BEST SANDWICHES IN WASHINGTON, D.C. Period. 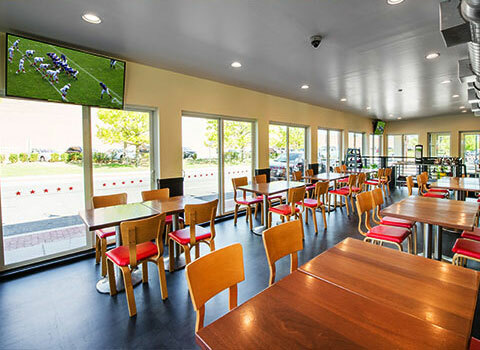 Located at the rear of Capital Auto Auction, across the street from the Brentwood Post Office, and two blocks north of Union Market, MGM Roast Beef has become a neighborhood gem, that “provides relief from Brentwood’s dreary chains”. 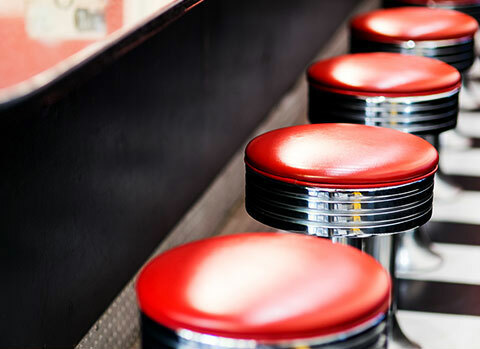 The restaurant was originally built in 1950’s American Diner style, with customers sitting behind the counter. A new dining room has since been added to accommodate the growing number of residents and workers in the reviving Brentwood area. Walk in our doors and you will be mesmerized by multiple glistening slabs of juicy, daily house-roasted meats: top round, beef brisket, bone-in ham, and turkey (white and dark meat). 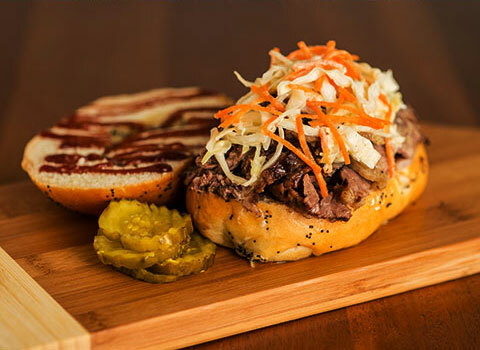 Watch as your sandwich is freshly carved from your choice meat(s), stacked on a fresh baked roll, and flavored with mouth-watering condiments and toppings. Sandwich options range from our usual selection of Top Round, Brisket, Turkey (white and dark meat), Ham, Tuna Salad, and Chicken Salad, to a variety of our customers’ favorite signature sandwiches. No matter what sandwich you choose, the delicious combination of fresh quality ingredients will delight the most delicate palate. 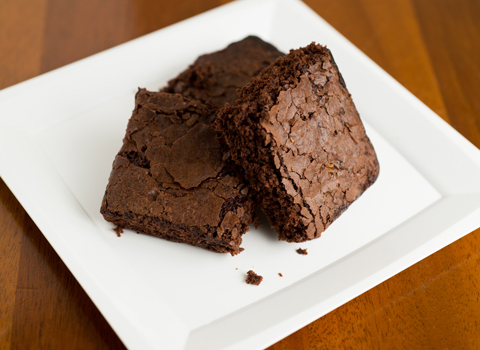 Aside from sandwiches, we serve fresh hand cut french fries, coleslaw, homemade soups, and (of course) desserts. For those who prefer a lighter lunch, but do not want to compromise on taste or quality, we offer our selection of salads with choices of different toppings, veggies, cheeses, and meats. Join us for breakfast and choose from our hearty portions of delicious pancakes, french toast, waffles, eggs, meats, grits, home fries, and oatmeal… you name it! Get a cup of coffee, take a newspaper, or join a casual conversation between owners and regulars. You will be surprised how nicely your day will begin. If you have never visited us before and are not sure if it’s worth the ride, we encourage you to check out our reviews online and in press. “Incredibly friendly service”, “meat is to die for”, “best sandwich in D.C.” – these are just some of the quotes from our valued customers. Try us out and see for yourself, next time you want a great sandwich picture yourself at MGM Roast Beef. The quality of our food is, and has always been, our number one priority. 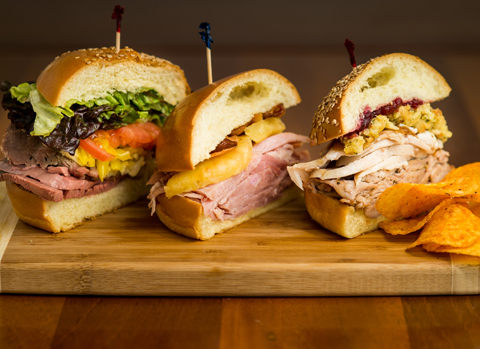 Each of our unique overstuffed sandwiches is composed from one of our five juicy slow-roasted and hand carved meats. The salads, french fries, crab cakes, and soups are cooked in-house from scratch. Desserts are freshly baked overnight every night. Whatever item on the menu you choose, you’re guaranteed to be pleasantly surprised by its fresh aroma and taste. This is a meat lovers paradise. The roast beef sandwiches were amazing! The rolls are fresh (the onion roll was delic), the roast beef perfectly cooked, and they even have fresh horseradish! The french fries are hand cut and really good. Jennifer F. Washington, D.C.
Their signature roast beef sandwich is consistently outstanding. I have yet to find a better one in DC. Try it with horseradish sauce or the fresh stuff. I can never finish it; it's generous…The french fries come with the skins on and make me wanna holler. Linda O. Washington, D.C.
MGM has one of the best good and cheap breakfasts in DC. They have pancakes, waffles, eggs, breakfast sandwiches, etc… And you receive generous portions. Come early and you wont be disappointed. Cherelle H. Washington, D.C. These guys do it right! Every sandwich is amazing! Their meat is slowly cooked daily and prepared perfectly. The staff is friendly and always ready to chat and help... I also see the owners in there helping out. A way a small business should be run. Boss F. Washington, D.C. I think I found my new roast beef place. The meat is to die for. Moist and flavorful, the offer options of roast beef either medium rare or well done plus ham and turkey if you're not into beef. I would highly highly recommend the juicy roast beef. Mary Kate M. Washington, D.C. I ordered the Thanksgiving Dinner sandwich. The turkey was so very tender and flavorful and absolutely perfect. It was open face style, piled with stuffing & gravy. Cranberry sauce on the side. SO GOOD. I'd go back in a heartbeat. One of the best sandwiches I've ever had. Mel C. Washington, D.C.
Everything is fresh and everything is from a real animal. No processed lunch meat garbage here. The dark meat turkey, brisket, and roast beef are like a time warp back to lunch at grandma's house. Real horseradish, fresh bread. I could go on all day. F. J. Washington, D.C. I just don't have the words to express. The taste was out of this world i mean the brisket was so good I wanted to go back and get another sandwich but i will go back today and get one i mean it was just the best roast beef i have ever had and growing up in Nebraska i have had my share of beef and this by far is the best. Antonio R. Edgewood, Washington, D.C.
Once we walked in, you could smell the delicious food and it made me even hungrier. I ordered the brisket, which was cooked to perfection. It's always great when you see the giant slab being carved right in front of you as they prepare your sandwich. They havea ton of condiments and cheeses to put on, and I believe you could put everything possible on this sandwich, and the flavor of the brisket would have still stuck out. Yes, its that good. Drew P. Washington, D.C.
Their kaiser rolls are exactly right, their condiments are good. But of course the whole story here is slow baked meat. Sort of like your Sunday supper club, they cook meats in small batches and leave them out at room temperature so that they stay at a pink "medium". Everything sells out fast. 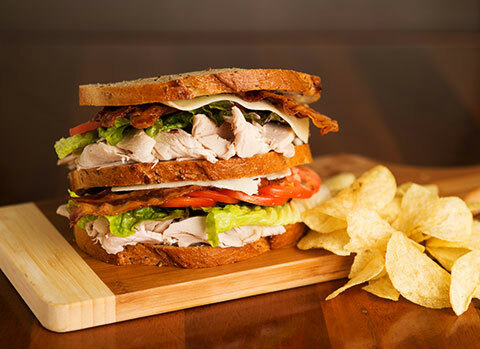 Ro B.
We’ve made it simpler then ever to order your favorite MGM Sandwiches and Salads. Simply print out the form below and fax it to 202-248-1263. We’ll have your sandwich and/or salad waiting for you when you arrive. No standing in long lines waiting for your order to be made. This page is currently under construction. To order catering or to speak with our catering representative please call (202)248-0389. Sorry for inconvenience.